The first ever live golf pay-per-view event is happening this Friday, and if you haven't heard about it by now you must be living in a bubble. Tiger Woods vs Phil Mickelson in a winner-take-all, $9 million mic'd up match - I AM DROOLING. 1. I do not miss a chance to watch Tiger play. Even though he's been in a slump the last few years, he seems to have found his groove again at the very end of last season, winning the Tour Championship. Although he faltered in the Ryder Cup, I think he's still got some of his best golf in front of him, and I am HERE for it. 2. Phil Mickelson. He's got to be one of the funniest personalities in golf, and I can only imagine what he and Tiger will say when they're mic'd up together. As for his golf, well, he's been up and down - it will be interesting to see how he performs with only a single opponent. 3. Two words: side bets. That's right, Tiger and Phil will have the opportunity to make side wagers throughout the competition, like closest-to-the-pin and long drive challenges, with winnings going to charity. We KNOW Phil fancies himself a gambler, so I imagine there will be many of these. 4. CHARLES BARKLEY. Yes, that's right, folks. 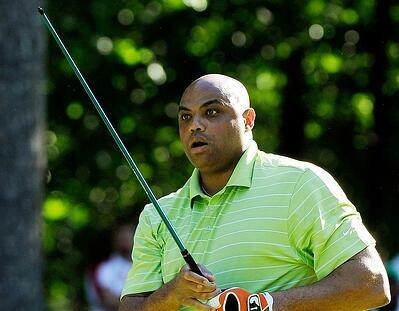 Sir Charles - the Round Mound of Rebound - will be on the pre-match show before the first tee. My excitement knows no bounds. Charles Barkley is so perfect for this assignment because the man genuinely LOVES the game of golf with all his soul, even though he is laughably horrible at it and he knows it. He will be joined by Samuel L. Jackson and Pat Perez, which will in itself provide entertainment fully worth $19.99. If you'd like to get a preview of what you may see Friday out of Charles Barkley, watch this lovely video remix that has been stuck in my head all week. The pre-match show starts this Friday at 2pm EST, with the golf beginning at 3pm EST. Watching this historic matchup will cost you $19.99 pay-per-view. For more info on how to purchase and watch, click here. By the way, we think Tiger will run away with a cool $9 million. What do you think? Comment below!